In 2014, new energy efficient lighting was added to the façade of the church to light the bell towers, Mary stone carving, and increase the illumination of the Rose Window. 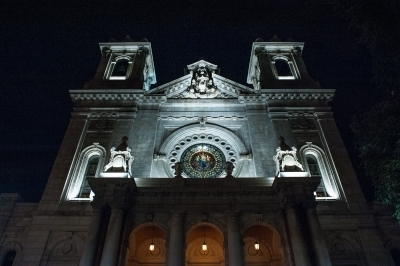 The front of The Basilica had been poorly lit and created a safety hazard. The new lighting has enhanced The Basilica’s appearance in the Minneapolis Skyline. Guests were invited to celebrate the debut of the new lighting at a special lighting event where attendees enjoyed fun glow-in-the-dark activities, complimentary refreshments, including locally brewed beer, and a lighting ceremony with live entertainment. A special thank you to the 2014 Emmanuel Masqueray Ball Fund-A-Need donors for making this illuminating project possible.